Motorcyclist, James Millar, owes his life to an air ambulance helicopter crew. He was involved in a horrific road traffic collision in August 2015 when a driver pulled across his path. He suffered two cardiac arrests at the scene. Thanks to the air ambulance service, he was taken to hospital by helicopter where he remained for 31 days in either the High Dependency Unit or Intensive care being treated for his injuries. 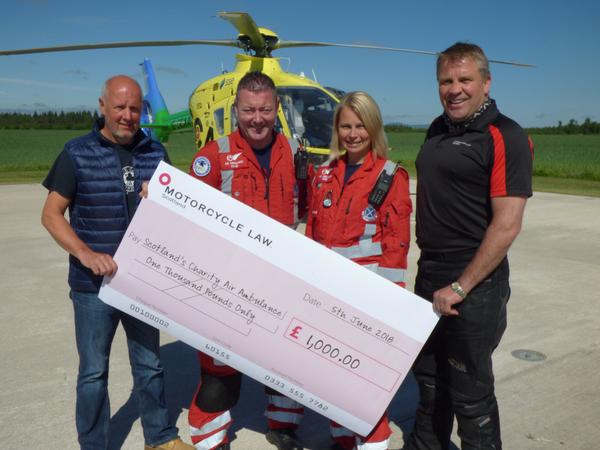 This week, he handed over a cheque for £1,000 on behalf of Motorcycle Law Scotland (MLS) to Scotland’s Charity Air Ambulance (SCAA) to support all the work that they do getting injured motorcyclists, like him, to a hospital as quickly as possible. Road traffic collisions account for 24% of the SCAA’s helicopter’s workload. To date, the charity has flown to 340 traffic incidents and of these, 114 (35%) involved motorcyclists. David Craig, CEO of SCAA added: “We are very grateful to MLS and to James for their donation. As a charity which relies 100% on funds from the public, it will contribute to the daily life-saving work of SCAA. With road traffic collisions representing a high proportion of all our call-outs, the support we receive from the motorcycling community is tremendous”.